Additionally, there are three core requirements, or parts, that are compulsory and are central to the philosophy of the Diploma Programme. The three core requirements are: Extended Essay, Theory of Knowledge, and Creativity, Action, Service. 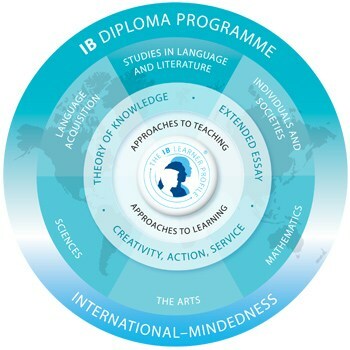 The curriculum's six subject groups together with the three core requirements are illustrated by the IB hexagon below. Parents please visit our secure Parent Portal for specific information regarding the your child's IB Diploma Path. The grading system is criterion based (results are determined by performance against set standards, not by each student’s position in the overall rank order); validity, reliability and fairness are watchwords of the Diploma Programme’s assessment strategy.